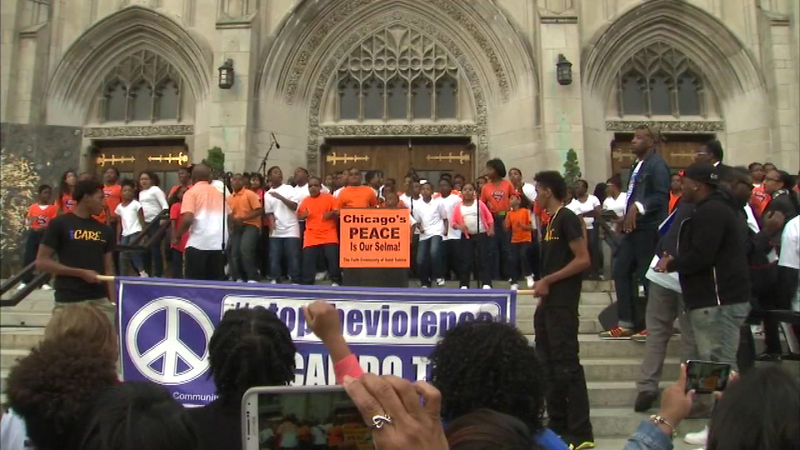 CHICAGO (WLS) -- Protestors claim director Spike Lee and St. Sabina Church saged a fake rally to get media coverage for the upcoming movie "Chiraq". "We don't think it's fair that you come here to our city, capitalize on the murders here and then you go back where you come from and the only people benefit from it is you and Father Pfleger," one protester said. "Let our community benefit from it. It ain't right." Those protesters rallied outside St. Sabina Church today. They wanted to hear from Father Pfleger himself, but a church official instead addressed accusations against the rally on June 19th. "The march that is being called fake is our annual march that has taken place for years on the last day of Chicago Public Schools to call for peace and safety for the summer," the official said. St. Sabina officials say they stand behind director Spike Lee and "Chiraq" for what they call a mission to help save lives.